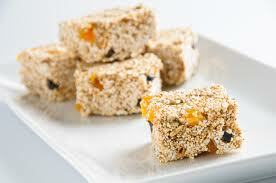 Nutty, naturally sweetened healthy sweet slices of chewy heaven ~ gluten, dairy and guilt free !! 1. Generously coat a 21cm square cake tin with ghee or butter. 2. Combine agave syrup and ghee in a large saucepan. Cook over medium heat for 7 minutes, stirring constantly, until the syrup bubbles and starts to caramelize. 3. When the mixture turns golden brown and becomes thick and sticky, add the popped amaranth, millet, sunflower seeds, pumpkin seeds, apricots, figs, cocoa nibs and honey; stir with a wooden spoon until all ingredients are coated with the syrup. 4. Transfer the mixture to the cake tin. Push the mixture into the corners of the cake tin by hand. Let cool and harden. Cut into 16 bars (approximately 2” by 3” squares).